With so many moving parts, it’s hard to know what needs to be repaired and maintenanced and when. 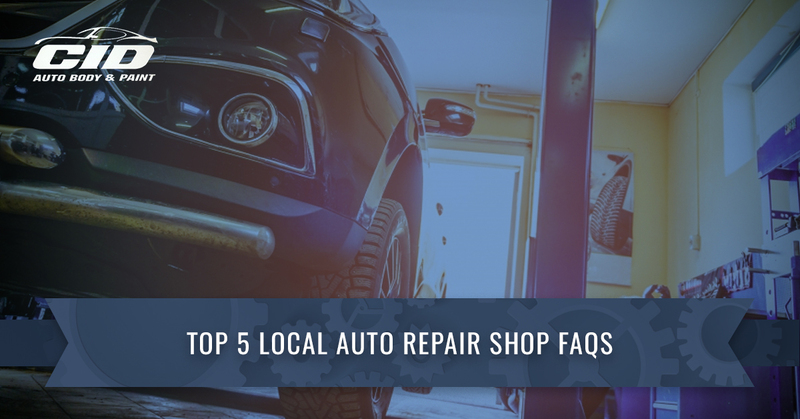 CID Auto Body and Paint, a San Marcos auto body shop, will go over some common auto repair FAQs as well as some common auto body repair FAQs to help you get a better grasp of auto maintenance. Contact us today for all your San Marcos auto collision repairs today! This is a very common question CID receives at our San Marcos auto body shop since most people know they have to change their oil to have an efficiently-running vehicle but don’t necessarily know when. In general, auto makers now recommend you have the oil changed in our car between 7,500 and 10,000 miles, or once every 6 months, if your vehicle is less than 10 years old. Older vehicles will need oil changed around 5,000 miles. This is due to the changes in engine design and manufacturing, allowing newer cars to go longer between oil changes. However, it’s always a good idea to check with your dealership for specific guidelines for your vehicle’s make and model. At your oil change, your air filter, fuel filter, fluid levels, and tire wear will be checked as well. One of the best inventions is the little sticker auto repair shops and auto body shops put in the upper left-hand corner of your front windshield to remind you around what mileage your oil should be changed next go-around. This is another common question our San Marcos auto collision shop receives. Due to the inherent design of your vehicle, the weight is distributed unevenly on your tires, since the front end is heavier than the back end. Rotating tires disperses tread wear, so you don’t hydroplane and fishtail in inclement weather. A good rule of thumb to follow here is to rotate your tires every time you get an oil change. This should be between 5000 and 6000 miles, or once every six months. This will help you remember to do it and help you remember the last time you did rotate your tires. A local auto repair shop can rotate your tires when needed. My check engine light just came on. What should I do? The most misunderstood symbol in your vehicle, the check engine light usually freaks people out. If you own a newer vehicle, there are many sensors that will alert you when your car senses something wrong because computers in your vehicle are programmed to monitor vehicle performance. A battery symbol or oil lamp could light up, from “low tire pressure” to “check engine,” your car could be trying to tell you a hundred different things. Your check engine light tells you there’s a problem in the electronic-control system that it can’t correct. The computer in your vehicle will store a trouble code in its memory that indicates the source of the problem, which an auto repair technician can then read. Blinking check engine lights can indicate a more serious problem than a check engine light that remains steady. Either way, a check engine light warrants a visit to your local auto repair shop as soon as possible in order to minimize damage to your vehicle and costs in the long run. Do I always have to have my car serviced at a dealership to have my warranty stay valid? As long as you follow the warranty guidelines that were laid out in our warranty, you are free to choose any auto repair shop or any auto body shop to have work done to your vehicle. However, if you purchased an additional warranty service through the dealership at the time of purchase of the vehicle, most likely all of those repairs will have to be done at the dealership from which you purchased the vehicle. In terms of general auto repairs and auto body repairs that are not covered under warranty, most reputable auto repair shops and auto body shops warranty their individual work. This means that if something goes wrong on something you had fixed (within reason), the auto repair shop or auto body shop will repair it at no additional cost to you. A car diagnostic can be compared to an annual exam by your physician. Its purpose is to assess your car and determine if there are any warning signs or signs that there is something wrong with it. This is not just for when the check engine light is on. Due to the computerization and advanced technology under the hood of the car, specialized software can not pinpoint exact problems in the car’s engine as well as problems with the transmission, exhaust system, and brakes. Performance issues can now be accurately validated as well, such as with the fuel injector, air flow and coolant, ignition coils, and throttle. If you recall, above we mentioned how a code was generated and stored when your check engine light came on. A common misconception is that this code reveals the exact problem. In reality, the code tells auto technicians which engine or component parameters are out of whack, but the code does not detail the cause of the problems. An excellent auto technician with expertise and experience will still need to diagnose the underlying problem. Diagnostic testing of your vehicle can be undertaken at anytime, especially if you feel something is “off” with your vehicle but have no clue what that may be. Uncovering minor problems that could become major is one reason to have your car diagnostics checked once a year, just like at a doctor’s office. One more use of diagnostics for your car: when you’re buying a used vehicle. Any major issues with the engine or transmission as well as performance-related issues will show up, which could save you hundreds, if not thousands, of dollars down the road. CID Auto Body and Paint is your go-to San Marcos auto body shop for auto collision repair, auto body paint, windshield replacement services, PDR (paintless dent removal) services, and fleet and industrial services. Our sister shop also offers Rhino Lining. CID Auto Body and Paint understands how important your vehicle is to you. Odds are, without a working automobile, you would have a hard time getting to work, getting your kids to school and to all of their activities, and even buying groceries would become a hassle. We do our very best to get your auto body repair in San Marcos done efficiently and quickly. We serve San Marcos as well as Encinitas, Vista, and Escondido for all your auto body and auto collision repairs. Contact us today for your free estimate!